Thank you for choosing Katie Lister Photography! This page will guide you through how best to prepare for our photography session, including what to expect, clothing choices, how the session will run, and choosing your final images. I’ve incorporated my experience at being both behind the camera, and in front of the camera for my own photography sessions, to help you get the most out of yours. If you have any other questions, please feel free to contact me at any time. Our photography session will last between 1-2 hours, but I don’t tend to watch the clock and am guided by the energy levels of the children involved. I will take a wide variety of photographs – invididuals, pairings and family groups. If you’ve got something specific in mind, please do let me know! I will guide you through the session to help you feel at ease – most of my images with children are based on fun and games to keep everyone relaxed and capture natural expressions. The session will revolve entirely around the children, and we will take breaks where necessary. It helps if we can plan a time when babies and toddlers will be well rested and fed, and feel free to bring (clean) snacks along to the session, as well as plenty of water. Worried that your children won’t behave? Please don’t! I am experienced in working with children of all ages and know how to get the best from them. I can coax even the most reluctant of children into having fun. It is not necessary to coach or bribe your children to smile or look at the camera – I’m looking for natural expressions and will interact directly with your children to get the best from them. I might ask for your assistance in capturing the attention of younger children, but I may also ask you to step away and let me focus on engaging directly with little ones (or older ones!). Please don’t be offended if I do this and just use it as an opportunity to relax! For sessions with babies or young children, please bring wet wipes, spare clothes and nappies, and a few favourite toys, If you have a favourite baby blanket or two, please bring them along to add a personal touch to your images. I favour shooting in rooms with plenty of natural light, so would welcome to chance to look around your home and choose which areas will work best. I can supplement natural light with flash if and where required. 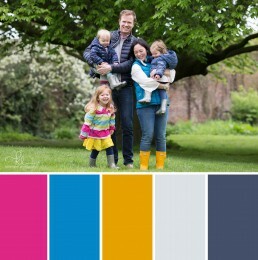 Light permitting, my favourite places to photograph your family are the lounge, master bedroom and children’s bedrooms. Tidying and decluttering these areas will help me, but I’m prepared to do this when I arrive and am known for shifting things around to get the right shot! Please advise me before our session if you have parking or access restrictions in your area. If we are holding our photography session entirely on location, then I will agree with you beforehand exactly where we will meet (public spaces can be be vast! ), and you will easily spot me as the person carrying the large camera! We will take photographs in various different spots within our chosen location. If the weather does not permit us to shoot outside, I will reschedule our session at no additional cost. I always reconfirm location sessions on the day itself, due to weather limitations. The aim is for your family to look coordinated, but not matching. 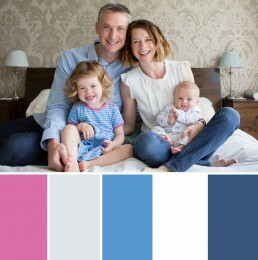 By sticking to 3/4/5 complementary colours (depending on the size of your group), each family member will look different, but you will avoid looking too ‘busy’ (clashing colours, too many colours), or looking like one colour block (too much of the same colour). For example, choose blues, pinks or pale greens with beige or grey and a dash of white. All black or all white clothing is best avoided. If we are shooting in a casual setting such as the beach or park, then try to keep your clothing casual too. The same goes for your little ones – when dressing babies please keep clothing fuss-free. If we are at home or the outside temperature allows, I thoroughly recommend just a vest or babygro for the tiniest family members. When I’m in front of the camera for my own family photoshoots, I always splurge on a blow-dry for my hair. Not only does it make me look nice, but it makes me feel confident and happy. It’s a small cost in the grand scheme of what I invest in family photography. This isn’t essential of course, but if there’s somthing that helps you feel great, treat yourself! You will receive a link to a password-protected gallery of 30-40 images within 2 weeks of our session. The gallery is open for two weeks for you to place your order of digital files, frames and/or prints. I am always on hand via email or phone, or in person if you prefer, to help you choose your favourites. Your gallery link can be shared with friends and family if you wish. Delivery of your final products will take place as soon as possible after your payment is received. Exact timings will depend on what you order. You will have read my full price list before you booked, but here’s a link again. If you have any other questions, please feel free to contact me at any time. I look forward to meeting you and your family soon!